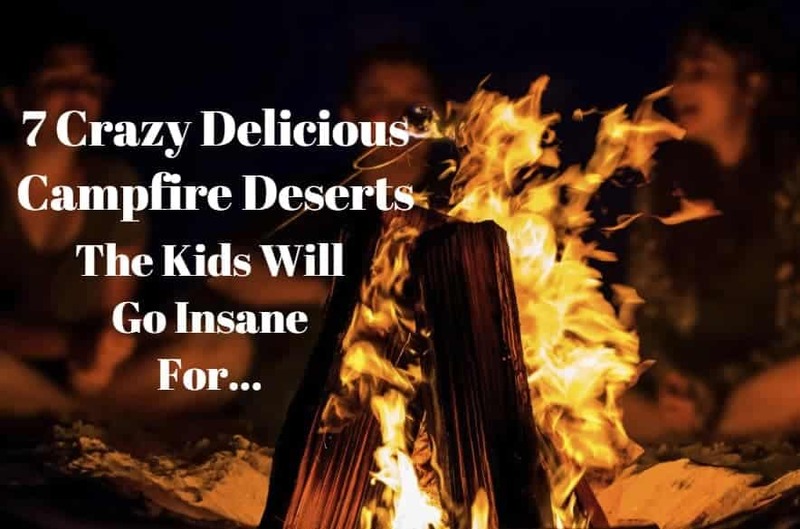 7 Crazy Delicious Campfire Desserts – If you have memories of sitting around the campfire as a child, one thing is for certain: S’mores were involved. But in the age of Pinterest, you can bet campfire desserts have come a long way since you were a kid. The old classics still star in most of the campfire memories we’re making today, but you’ll find some new twists and fancier add-ons that are sure to become classics before long. In some cases, inspiration from Pinterest can do more harm than good (think Pinterest fails). Fortunately, this isn’t one of them. 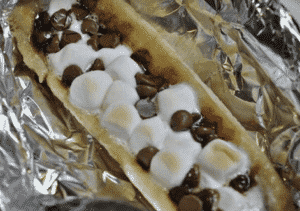 The Campfire Desserts you’ll find on this page are easy and do not require any special skill. Also, you may even get bonus points for the messiest version (those are often the tastiest anyway). But first things first. You’re going to struggle making just about any campfire dessert (especially s’mores) if you don’t know how to roast a perfect marshmallow. It’s more of a science than you may think, and a perfectly-roasted marshmallow is what will elevate your s’more game to the next level. This is what makes your s’mores better than the Jones’s. Also, if you’re out of chocolate and graham crackers, a well-roasted ‘mallow makes a good stand-in dessert… in a pinch. Before you roast anything, you’ll obviously need a good fire going. This should probably go without saying, but it’s important to get the fire ready before you get everyone excited for a treat. This means starting the grill about an hour in advance. Many people just leave the grill on after cooking dinner, and that’s perfectly fine. Next, you’ll need good sticks. Metal skewers work well if they have a wooden or rubber handle that will keep your hand from getting too hot. Sticks from the forest work equally as well, as long as they’re long enough to keep you out of the fire. After you impale your marshmallow, look for a spot where the charcoals are glowing, but not producing a flame. This is your spot. It’ll produce enough heat to caramelize the marshmallow without setting it ablaze (we’ve all been there). Once you get a nice caramel-brown color, turn the marshmallow and brown it evenly on all sides. Everyone will think you’re some kind of marshmallow-roasting wizard. But be careful. With great talent comes great responsibility. You may see a line form behind you as everyone waits for you to produce their perfect marshmallows. Okay, so you have a pile of perfect marshmallows. What now (…as if you didn’t know)? We’ve already covered how to roast the perfect marshmallow. 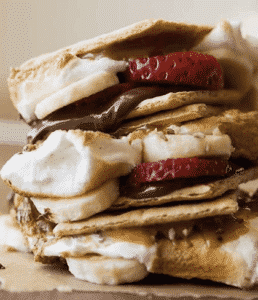 Now, we’re not going to insult you by telling you how to build the perfect s’more. You’ve got that part covered, for sure. Instead, we’re going to look at some upgrades to that old classic dessert and some new campfire desserts you may want to add to your repertoire. Mason jars are so handy that you’ll probably plan to bring a few on your trip anyway. They’re great for packing up leftovers or storing liquids that you want to keep from spilling. For the mason jar s’mores, you’ll probably want the half-sized jars as a full-sized mason jar might challenge even the sweetest tooth in the bunch. The ingredients are very similar to your typical s’mores. Boil water in a small pot on the grill. When the water is boiling, add the jar of hot fudge. Heat to the package instructions. 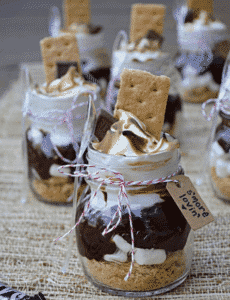 Crush ½ sheet of graham crackers into a mason jar, add a layer of mini marshmallows, and then add a layer of hot fudge. Top with another layer of crushed graham crackers and top with mini marshmallows. If you want to get fancy, caramelize the top layer of mini marshmallows with the blowtorch. The best part about this recipe is that it’s completely portable, and you don’t necessarily need the grill. You can easily make it on a stovetop when you’re looking for a fun campfire-esque dessert at home. The baked apple is another campfire classic that’s easy to customize. You’ll find some of the basic ingredients here, but feel free to switch anything up. Craisins are a great sub for raisins, and walnuts work well in place of pecans. Make this recipe as is or make it your own. 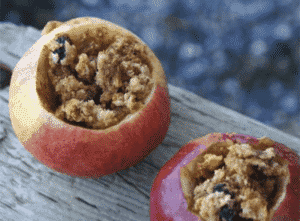 Remove the core from each apple while leaving the bottom intact. You may find the spoon handy to help get the core out of the apple. Set apples aside. Mix the remaining ingredients (except the butter) in a small bowl. Spoon some of the mixture into each apple. Add as much as will fit, and you may have some mixture left over. If you have enough, someone can have a tasty granola breakfast in the morning. Spoon a dollop of butter on top of each full apple and cover individually with aluminum foil. Place the foil-wrapped apples directly onto hot coals and cook for about 30 minutes. You can start checking at 20 or 25 minutes to see if the apples are tender. Once the apples are tender, your desserts are ready. Obviously, a banana split sundae isn’t going to make the cut on any camping trip (unless you’re a fan of sketchy iced cream soup). But banana boats are the next best thing. They’re so easy to make that you’ll probably even start having them at home. As a bonus, the kids can help or prepare these themselves, depending on their age and culinary skill level. Naturally, you’ll want to keep the little ones away from the fire. Leave the bananas in their peels and cut a slit down the inside-middle, starting about 1/2-inch from one end and ending about a ½-inch from the other end. Open the peel wide to expose the banana flesh. You may do a little mashing with your fingers to ensure the banana flesh remains at the base of your desert. Just push down on the flesh a bit before you move on to the next step. Next, add your chocolate (as much or as little as you’d like) and top with marshmallows. Create little banana-sized boats for each banana, set the banana inside and place it foil-side down on the hot coals. Grill for 5 to 10 minutes and enjoy. 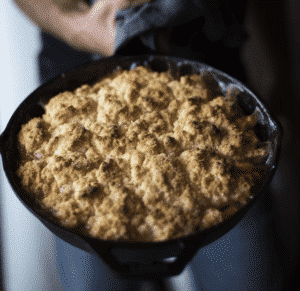 This campfire dessert is about as simple as it is satisfying. You’ll only need a few ingredients, but this simple and unexpected dessert does not disappoint. You might think the burrito part is a little strange, but bear with us. You will be using a standard flour tortilla, but this is not your typical savory burrito. Oh, and you can also use a corn tortilla in a pinch. It does add a bit of a corn flavor to the dish, but that’s not necessarily a bad thing. Like most recipes on this list, feel free to customize as you see fit. Add things like peanut butter, fluffernutter or strawberry jam to make this campfire dessert your very own. 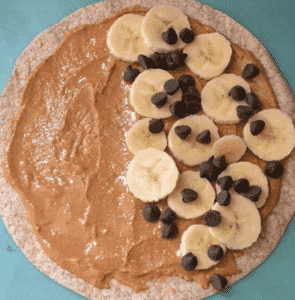 Lay each tortilla face up and cover with a layer of chocolate followed by a layer of sliced bananas. Top with mini marshmallows, and then roll up the tortilla as you would a burrito. Wrap in aluminum foil and place on the hot coals to heat for about 10 to 15 minutes. You’ll want the banana slices to soften and the chocolate to melt. Campfire Cones has a nice ring to it, but you might start getting a hankering for iced cream when you see those waffle cones. But don’t worry, you’ll soon forget about that frozen dairy dessert when you start chomping on your campfire cone. This is another dessert recipe that’s completely customizable, but you may want to make this one first to get a feel for how it’s done. One of the greatest benefits of this dessert is that it’s relatively mess-free. You will need spoons for eating it, but this self-contained dessert is a mess-free winner. Fill each cone with the ingredients, layering as you go. It’s important to keep the peanut butter layers thin to avoid getting a mouthful later. Wrap each cone in aluminum foil and place onto hot coals. Let the cones heat for 10 to 15 minutes as the chocolate and peanut butter melt and the banana softens. You can eat these without a spoon, but you’ll end up with chocolatey goo all over. Don’t ask how we know. Heat the cast iron skillet over hot coals. Once the skillet is hot, add the butter, and then add peaches in a single layer. Cook for about 3 minutes until they soften and you begin to see some caramelization (brown spots). After you see some brown, flip the peaches and cook for another 3 minutes. Add 3 tablespoons of sugar, and stir until it’s well incorporated and the granules melt. All of your peach slices should be covered in a layer of sugary goodness at this point. Continue cooking for 8 to 10 minutes. Remove from heat and serve with a healthy coating of granola. If you have them, mini mason jars are the perfect vessel to serve this cobbler. We round out this list with a twist on the classic. This one is for those people who actually don’t know how to make s’mores (the right way), and for those looking to upgrade their old standby. Get your ingredients ready: Slice your strawberries, and separate your chocolate squares and graham crackers. Stack one piece of chocolate and one or two strawberry slices on top of a graham cracker square. Do this for as many marshmallows as you’re roasting. Set aside. Follow the instructions at the beginning of this post for roasting the perfect marshmallow. Once your marshmallow is roasted, rest it on top of the graham cracker with chocolate and strawberries. Take another graham cracker square and place it on top of the marshmallow. Use the graham crackers to help you slide the marshmallow off the skewer. And you’re left with a delectably delicious s’more. 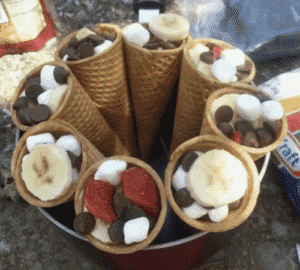 Camping is all about creating lasting memories, and you can bet that you’ll never forget the experience of sitting around the campfire making these desserts. The smell of cooked peaches or the sight of a marshmallow will forever jolt you back to this place and time, as you made beautiful memories and delicious desserts with your friends and family. Just think about the warm and fuzzy feeling you get when you see s’mores being made by the fire. These are more than just plain old desserts. They are full experiences that will be ingrained in your family’s history forever. No pressure. It’s a good thing these desserts are easy! P.S. Going camping soon? Why not read our full camping checklist article and make a trip to remember. Read it Here!